A big papier-mâché pig sits on a table during Patty Mitchell’s pop-up studio at L&M Products. The pig represents a piece of Preble County culture, symbolizing the Pork Festival held the third weekend in September. Joe, an employee at L&M Products, painted in the pop-up art studio on Thursday, June 11. Estin, an employee at L&M Products, makes papier-mâché tusk to go along with his pig on Thursday, June 11. Charlotta, an employee at L&M Products, paints a pig pink in the pop-up art studio on Thursday, June 11. Laura Cummings, from Norwich Consulting Services, assists Denise, an employee at L&M Products, with the papier-mâché as they create a tiny pig in the pop-up art studio on Thursday, June 11. EATON — Patty Mitchell, a traveling artist working with Collaborative Art International and Norwich Consulting Services, turned an empty space at L & M Products into a land of creativity during the week of June 8. The proper nomenclature for the artistic space is “pop-up studio” but Mitchell’s vision is bigger than that. “Our mission and obsession is to help them to go from a hanging out program to creative environments throughout the building. My mission is to do something big and ‘spectacle-y’ so there is no doubt that this is fun and that people like to do it,” she said. “It has the opportunity to continue. People are going to come here for the next 20 to 30 years. There’s time. Mitchell travels from community to community, trying to build strong connections and ties to each culture. Her passion has been working with people with developmental differences. At the beginning of the week, she and her crew started by immersing themselves into Preble County’s culture and trying to figure out the best way to represent the area. The one event that seemed to keep popping up was the ever-popular Pork Festival, which is held the third weekend in September. Thus, Mitchell began concocting papier-mâché pigs with the help of the employee’s at L & M.
“As members of the community, we want to participate in what’s going on out there and support what’s happening so that this is an active resource for the entire community,” she said. The workshop allowed the employees to stop in and create however they saw fit. Some sat and painted, some drew, and many helped create and paint the papier-mâché pigs. They also drew volunteers to stop in and help whenever possible. 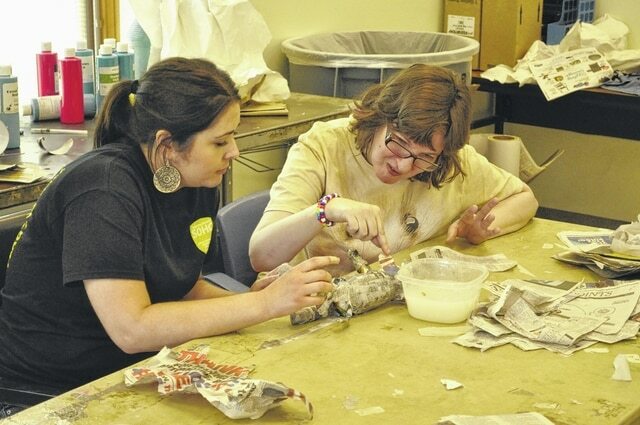 Mitchell has written a book titled Upcycling Sheltered Workshops that focuses on the very model she brought to Eaton. The workspace isn’t supposed to die when Mitchell and company leave the premises though. She is hopeful the event inspires the members of the community and will continue to build upon the momentum and interest she brought in during her week here. “Our business is to generate as much fun and joy and spectacle as possible and it just has a life of its own. That’s it,” she said.